Pelee Island is part of the Western Lake Erie Islands (WLEI) which form an archipelago of 22 islands spanning the border of Ohio and Ontario. 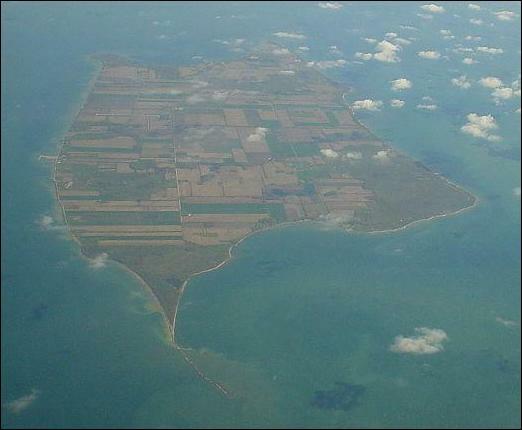 Pelee is the largest of these islands and is the southernmost Canadian land mass. Located along a small section of the eastern shore close to a public access point along the beach, there is evidence of the erosional forces upon the bedrock from the advance and retreat of the Wisconsion Glacier. Glacial Abrasion occurs when rock and debris, also referred to as clasts, are picked up by an advancing glacier and moved along at the base of the glacier over the bedrock where it scours and scrapes the land and soil below, similar to the effect of sandpaper on wood. Deep, long marks or scars appear on the surface of the bedrock below, running in straight, parallel lines indicating the direction the glacier was moving. Striations appear as scratches of various size on the rock surfaces. In some cases this abrasion can polish the rock surface to make the rock appear smooth. This geomorphic feature is known as glacial polish. The abrasive action of this scouring also produces a fine clay sized sediment that is often transported away from the glacier by the meltwater, giving the glacial meltwater a light, cloudy appearance called glacial milk. Grooves appear as long, parallel depressions in the bedrock attributed to larger, heavier rocks and sediment carried in the base of the glacier. Striations and Grooves can be found in all types of rock formations. Limestones are known to form striations easily but are also subject to weathering and erosion more easily than a harder rock like quartzite, which is more difficult to create striations on, however once they form, are less susceptible to weathering or erosion. Type 2: This type is classified by a slowly rotating clast which increasingly causes deep gouges until it reaches the midpoint, in which the clast rotates at a higher page until the clast has the same velocity of the ice, causing the striations to be less deep, and smaller in size. 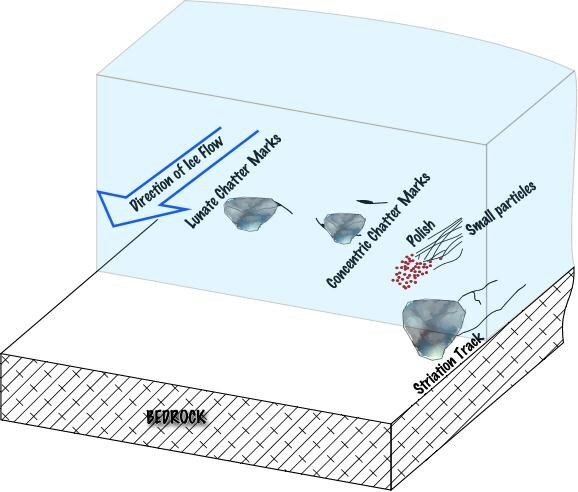 The deep gauges leading to the midpoint are a result of a large ploughing angle, however this angle decreases as the glacier passes over the rock. Type 3: Formed when a clast initially comes into contact with the rock surface, and as the clast rotates down ice, it becomes displaced and the ploughing angle decreases. This causes the striations to decrease in size as the glacier continues to move. Proceed to the trailhead from the parking coordinates. I have confirmed with the land owner to the south or right of the lane that this is a public access lane way and trail to the shore and NOT private property. The beach is also public access and you are able to walk along the shore so long as you remain between the water and the treeline. You will need to visit three locations along the shore, a short distance from the trail, where you will be able to see the effect of the glacial abrasion on the bedrock. At the first reference point you should be able to see numerous scratches along the rock. At the second and third reference points there are larger glacial grooves cut into the bedrock. Determine the direction of the glacial iceflow across the rock as the glacier advanced. Provide the bearing. From the three category types listed, can you determine which type created the grooves. Can you determine what type of rock the grooves and striations are carved in. What evidence is available at the site to help you determine this. Optional: A photo of you or your party is optional but always appreciated. Caution: Be cautious when walking across the rocks as they can be unstable in spots. 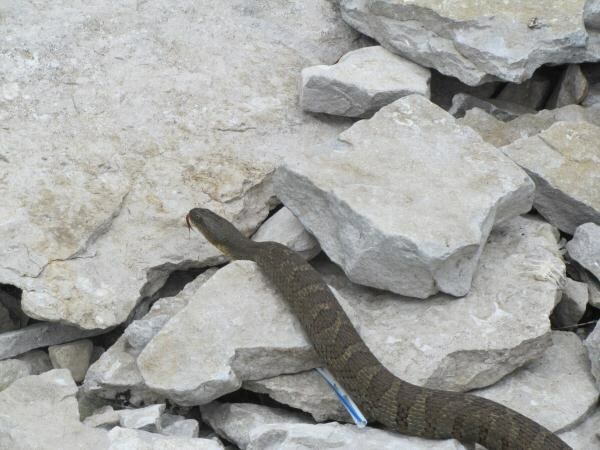 Also keep an eye out for the Lake Erie water snake. I spotted one in the water and almost stepped on one when walking across the rocks. Please do not remove any of the rocks from this location as they are there to help prevent further shore erosion. There is no need to trespass or cross private property to reach this cache. The grooves and striations can be found within after a walk along the shoreline from the access point noted.